Hamilton Naki Square in Langa. 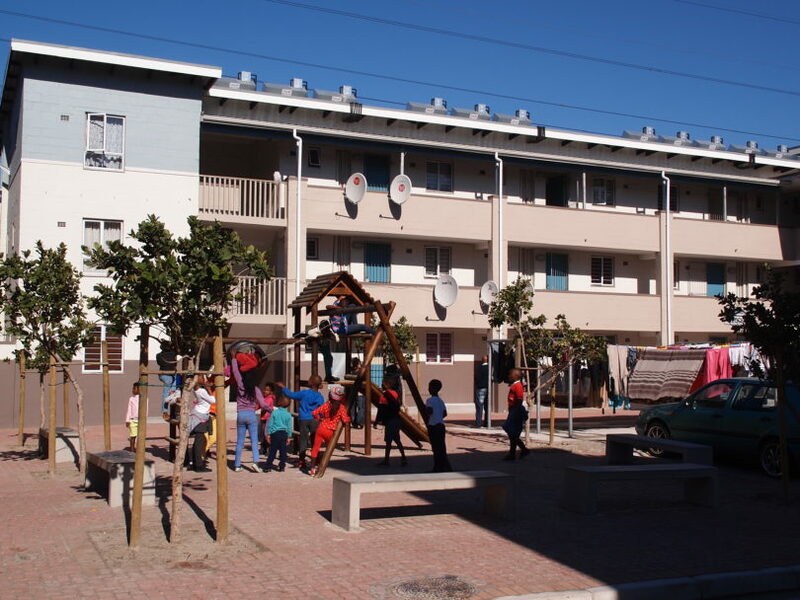 Hamilton Naki Square, one of the City of Cape Town’s Community Residential Unit (CRU) projects in Langa, has been recognised by the Cape Institute for Architecture. In recognition of the architectural, spatial and community-enhancing achievements, the City’s Hamilton Naki Square in Langa recently received the Cape Institute for Architecture Award for Architecture 2017. This CRU project offers housing opportunities to 463 tenants and their families. The planning and construction of these units was managed by the City’s Transport and Urban Development Authority, with the design expertise of Architects Associated (the architects for the project), in consultation with the City’s Assets and Facilities Management Directorate. The project cost close to R170 million and consists of 463 two-bedroom units of 40 m² each, across three-, four- and five-storey buildings. These rental housing opportunities are aimed at those people residing in the worst hostel conditions in the city, following the development of a priority model for all hostels in Cape Town. In an effort to provide the buildings with a sense of identity, the architects used the gradation of the buildings as well as the staircases or balconies and vistas to create a unique look. Furthermore, the precinct’s layout boasts a network of pedestrian routes, courts or play areas, a new public square on the corner of Bhunga Avenue and Ndabeni Street, as well as pockets of parking and allocated green spaces. Walkways and narrower streets have been created in the precinct to provide tenants with a thermal buffer and shading against the harsh south-easterly wind and sand and the horizontal north-west rain. ‘This project showcases the value of City departments and private companies working together to improve the living conditions of our tenants and their families. The teams who worked on this project should be commended for their creativity and determination. They did not allow the challenges of the sandy Cape soil to deter the construction. 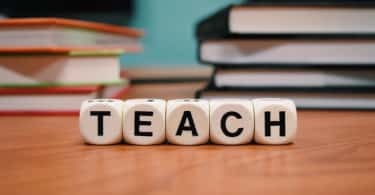 Instead, they used innovatively-designed foundations and a load-bearing system that used reinforced concrete blocks for the construction of the four- to five-storey buildings. Also, the ecological footprint of this building was reduced by not using reinforced concrete structural frames. “Over the 20-month period of construction, this project created employment opportunities for local labour and subcontractors, through the main contractor,” said the City’s Mayoral Committee Member for Transport and Urban Development, Councillor Brett Herron. “This project is line with the City’s Organisational Development and Transformation Plan which places our residents at the centre of service delivery and seeks to improve the way the City works and delivers services to communities“. “This project demonstrates our commitment to providing well-located housing opportunities, helping to create safer communities through urban design, and dedicating resources to spatial transformation and job creation.Furthermore, it strikes the balance between providing affordable rental housing in Langa for low-income residents and creating an environment which is enjoyable for the community, is pedestrian-focused, and assists in addressing crime prevention through its design by making the precinct more visible and accessible to patrols,” said Councillor Herron. The rentals are being managed by the City’s Assets and Facilities Management Directorate. “We are proud that our tenants and their families are able to enjoy affordable rental accommodation which has been recognised for its architectural, spatial and community enhancing achievements. In light of going green, all of our units are also connected to solar water heaters which offers our tenants some financial relief as the demand for energy and its cost decreases“. “The maintenance of the City’s rental stock usually forms a large part of our budget and therefore I am pleased to know that careful consideration was given to creating the robust architecture in order to reduce the level of maintenance required in future. 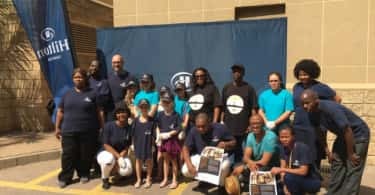 In this way, the budget could then be spent on other needs that will benefit our tenants and their families,” said the City’s Mayoral Committee Member for Assets and Facilities Management, Councillor Stuart Diamond.